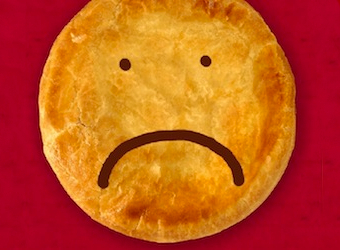 John Rice of Griffith University writes that Pie Face’s ambitious expansion moves have ultimately led to its downfall. Tolstoy’s opening line in Anna Karenina was: “Happy families are all alike; every unhappy family is unhappy in its own way.” The same can be said of most businesses – the recipe for success is simple, but there are an unlimited number of ways to stuff things up. Pie Face, the Australian fast-food chain, was notable for the quizzical, yet unfailingly jolly, face drawings on its pies. By most reports, its products were good. This week, to the chagrin of its loyal customers and investors, the firm has appointed administrators. Most likely, the smiling pies are no more. The collapse of the Australian chain comes at the end of a difficult couple of years for the franchise. In 2013, a trio of franchisees launched legal action against the parent for misleading representations about potential sales and profitability. Last month the majority of Pie Face’s New York stores closed without warning. Pie Face’s plans for global expansion are thus in serious doubt. Its ebullient founders, Wayne Homschek and Betty Fong, are seeking to salvage some value from the business. Time will tell if there is anything to save. There are a few lessons to be drawn from the Pie Face story. First, ambitious business growth most commonly precedes sudden business collapse. Pie Face signalled plans to take its business to global markets including South Korea, the UAE, Singapore and New Zealand, but any such growth would place significant strain on the organisation’s financial and managerial resources. Further, global expansion assumes global product acceptance of the product. While Australians have grown up with meat pies – with all of their diversity and ingredient vagaries – growing a business while also growing a brand and growing acceptance for something so foreign is an expensive and innately risky process in new markets. Second, industries with limited entry barriers tend to be relatively unprofitable – and the fast-food industry is an exemplar of a tough and competitive industry. Generally, fast food is a mature and stable sector, with limited opportunity to grow sales, margins and thus profits. Indeed, sales growth for firms like Pie Face must come at the expense of established competitors. This is especially the case in the hyper-competitive US economy, where customer choice in fast food is practically unlimited and established competitors have deep pockets. As this is the case, overlaying an expensive franchise model over a relatively simple business tends to layer high costs on businesses with limited capacity to generate the required sales and margins to meet those costs. Multinational chains like Starbucks learnt this lesson the hard way. Once competitors saw the profits to be had from selling coffee-derived drinks, they piled in to the business. Were Americans to somehow acquire a taste for pies, the same trend was likely. Third, franchise operations, while having many operational and strategic benefits, also have a fundamental problem. Structurally, franchisees operate in competition both with other firms and with the franchisor. The profit pool must be shared among the franchisees and the franchisor. As is often the case among franchisors, Pie Face had both company-run and franchisee-run stores. This tends to add more tension to an already fraught situation – as the legal action between Pie Face and some of its franchisees in 2013 illustrated. Patience is said to be a virtue – it also tends to be good business practice. Pie Face has tried to grow quickly and globally, tackling tough and well-established competitors while trying to create market acceptance for a novel and idiosyncratic product among global markets with diverse tastes. In hindsight, the events of this week are no surprise. There are lessons to be learned for the future about how to take great Australian products to world markets, but perhaps the most prosaic and important lesson of all is to take the time to grow a business with care.